Posted by Alex Maximiano about 2 months ago. 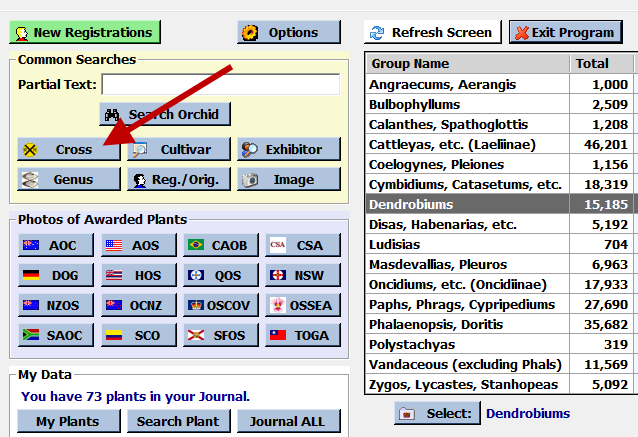 From the opening screen (Start tab) of OrchidWiz, click the Cross button. For Parent 1 Name, enter "arm" (this is easier than entering the full name "armeniacum"). For Parent 2 Name, enter "micra". 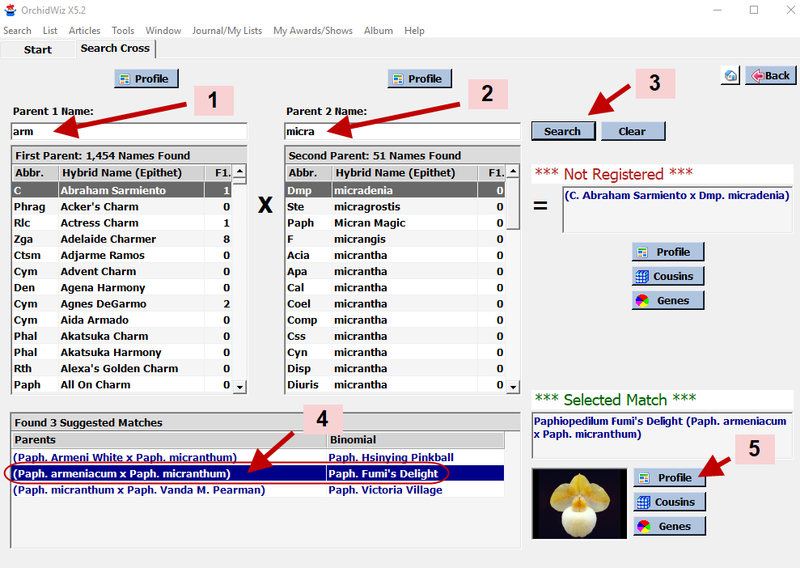 OrchidWiz will give you a list of three hybrids with one parent name containing the text "arm" and the other parent name containing the text "micra". Select the second orchid on the list, which is Paphiopedilum Fumi's Delight (Paph. armeniacum x Paph. micranthum). For Parent 1 Name, enter "armeniacum". For Parent 2 Name, enter "micranthum". 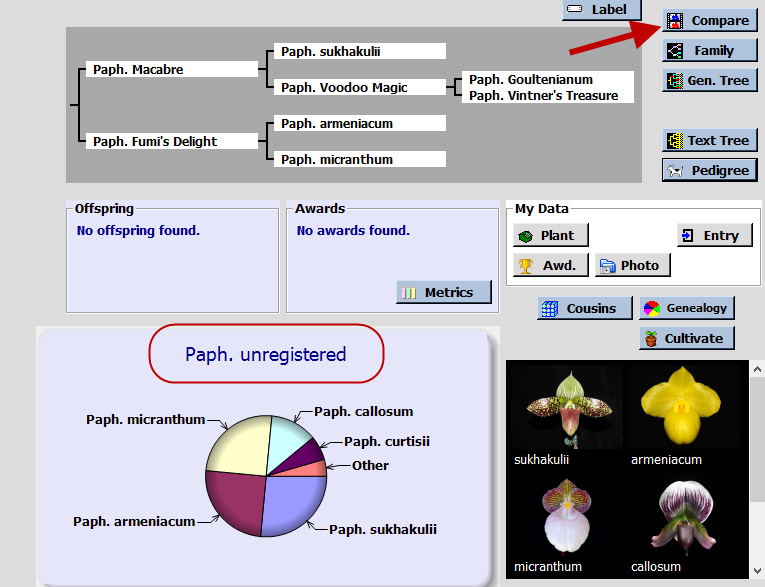 In the left column, click "Paph. armeniacum". In the right column, click "Paph. micranthum". For Parent 1 Name, enter "macabre". For Parent 2 Name, enter "fumi". 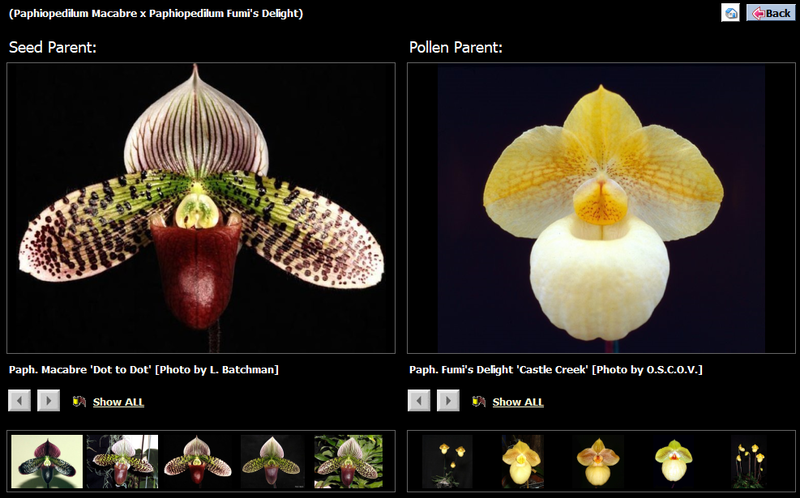 In the left column, click "Paph. Macabre". In the right column, scroll down and then click "Paph. Fumi's Delight". To read other articles on OrchidWiz, click the button below the title at the top of this page. If you like this article, please make sure to click the button "Like?" at the top of this page, below the author's name. Also, let us know what you think by posting your questions or comments below.